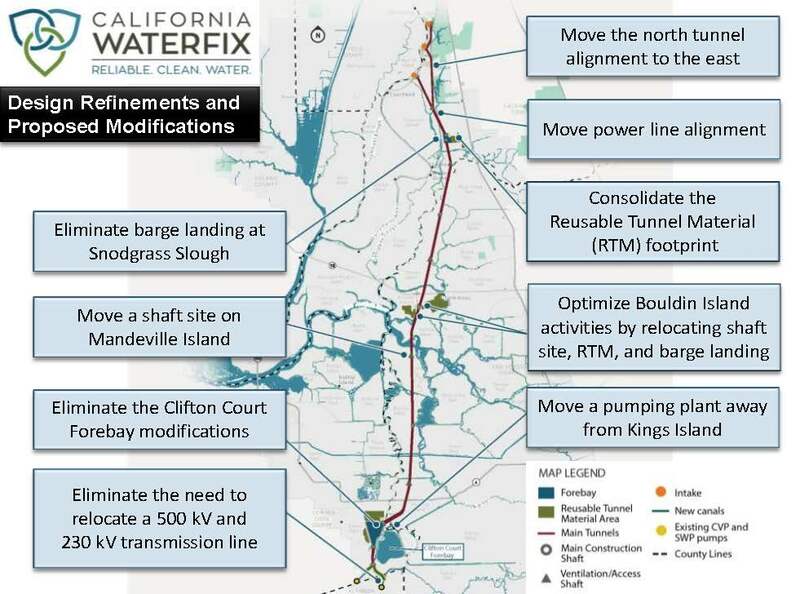 At the July meeting of the Metropolitan’s Special Committee on the Bay Delta, committee members received an update on the California Water Fix project, including a report on the recent meetings of the Delta Conveyance Design and Construction Agency and the Delta Conveyance Finance JPA. They were also briefed on the State Water Board’s update to the Bay Delta Water Quality Control Plan. Steve Arakawa, Manager of Bay Delta Initiatives, began with an update on California Water Fix. He presented a slide showing recent actions from other State Water Project contractors approving the project, and noting that most recently the Crestline-Lake Arrowhead Water Agency approved the project in early July. 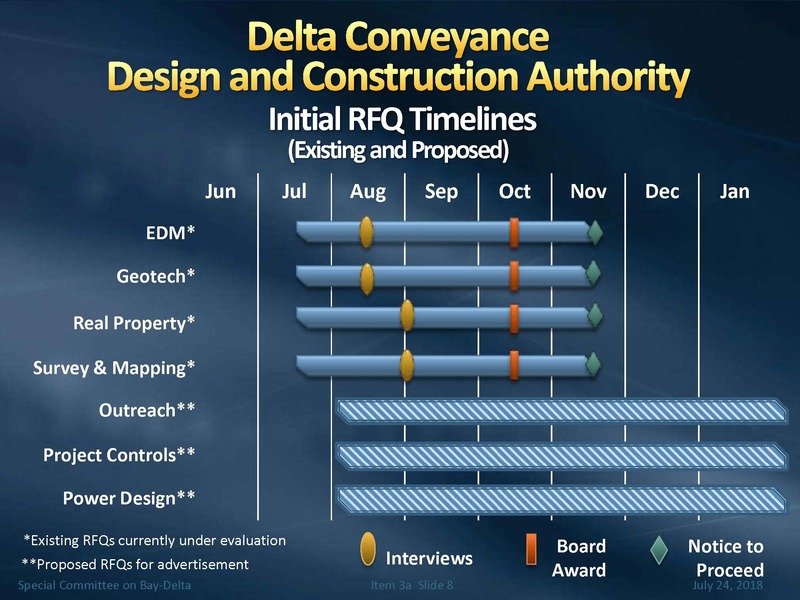 The Delta Conveyance Design and Construction Authority (DCDCA) met in mid-July. The DCDCA is the entity that would be under agreement with the Department of Water Resources to be responsible for the design and construction of the facilities. 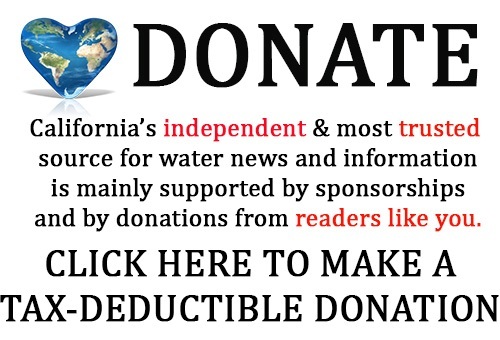 There are 5 seats on the board of directors, four of which are already filled: Metropolitan has two seats, represented by Directors Richard Atwater and Steve Blois, Santa Clara Valley Water District has one seat occupied by Tony Estremera; and the other State Water Contractors are represented by Sarah Palmer, board member with Zone 7. 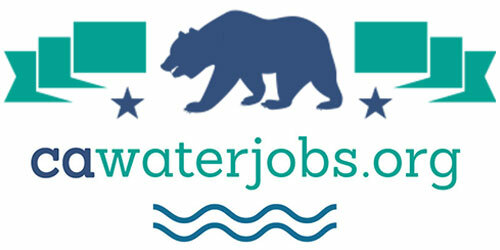 A position is being held for Kern County Water Agency as they have not yet taken the action to join the Authority yet. Tony Estermera is the president; Richard Atwater is the vice president, and Sarah Palmer is the secretary. The DCDCA met in mid-July. The board ratified the actions taken in May at its first meeting including authorizing the agreements with the interim Executive Director Jill Deurig and interim General Counsel Stephanie Morris. The DCDCA also authorized negotiating a lease for office space; authorized professional services agreement to provide financial controls and scheduling support services with the Hallmark Group; and authorized a document retention policy. The main action at the meeting was the board approval of the budget of $134 million for 2018-2019. Mr. Arakawa noted that the budget has a large contingency of $42 million which is to deal with things such as the timing of when actual bonds may be issued and sold. The objective of the parties in the JPA is to be in the position to begin bond financing a year out from this period in time, so the budget is set up to provide for expenditures over the next year and the contingency that takes into account that there may be a schedule change with the beginning of bond financing, he said. The DCDCA has issued an RFQ or Request for Qualification process to secure an engineering design manager, geotechnical services, real property services, and survey and mapping. They will be conducting interviews for the respondents beginning in August, with expectation of reaching a decision at the Board’s October meeting. If the Board takes action in October, there would be a notice to proceed expected in November. 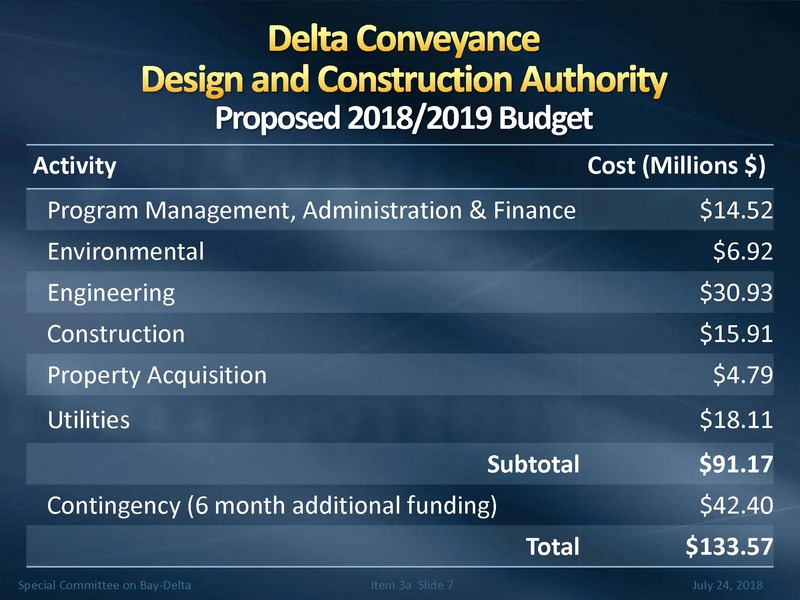 The Delta Conveyance Finance Authority also met for the first time in July. The Finance Authority is an entity with the single purpose of securing financing for the project by issuing, selling, and delivering bonds, and refunding bonds or notes. The parties to the finance JPA are participating public water agencies. Some water agencies have taken action to join the finance JPA; this allowed for the execution of the JPA agreement in early July. The term of the JPA is for 50 years or until all bonds have been paid. The Finance JPA will be governed by a Board of Directors; for administrative matters, each director will have one vote, but for finance decisions or additional bond issuances, the decision making would be based on weighted vote, taking into account the amount of responsibility of financing that each entity has. The Finance JPA will have an executive director and other staff as necessary but will likely be small staff-wise. The Finance JPA was formed on July 3rd as Alameda County Flood Control and Zone 7 voted to join the Finance JPA. 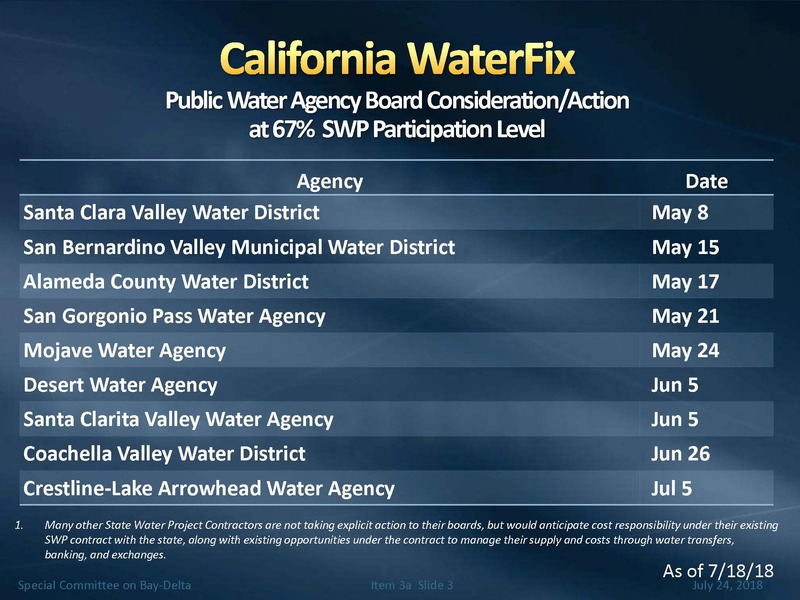 Since then, Metropolitan, San Gorgonio Pass Water Agency, and Santa Clara Valley Water District have taken action to join the JPA. At the first meeting, Chair Randy Record was voted in as president; Gary Kremen, Santa Clara Valley Water District board member was voted in as vice president; and Jeff Davis, General Manager and board member from san Gorgonio Pass Water Agency, was voted in as Secretary. The JPA agreement provides for additional members joining the JPA board as individual contractor entities vote to join the finance JPA. Other actions taken at the first meeting of the Finance JPA were to approve a professional service agreement with Michael Bell Management Consulting, Inc., to retain Brian Thomas as Interim Executive Director; they authorized Executive Director to negotiate and execute a services agreement with the Metropolitan Water District to provide treasury/controller and accounting services; and they also authorized sending letter of interest for Water Infrastructure Finance and Innovation Act (WIFIA) program assistance for $1.6 billion in loans for a portion of Water Fix. Next, Mr. Arakawa turned to the State Water Board hearing for the petition for adding points of diversion on the Sacramento River. The hearing began in July of 2016. It had two parts; Part 1 was the potential impacts to other legal water right holders, and that part is complete. Currently, they are in Part 2 which are the impacts to fish and wildlife; they will be starting the rebuttal phase on August 2nd. 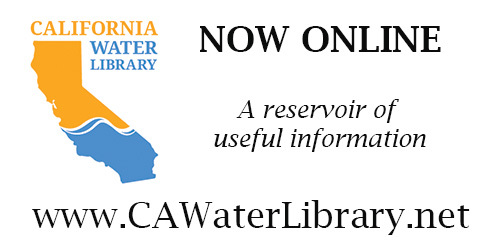 Since the final EIR for Cal Water Fix has been completed and certified, the Department of Water Resources and the Bureau have produced a draft supplemental CEQA/NEPA document to consider some refinements to the project, mainly to the physical facilities and the alignment, as well as other changes to reduce some of the impacts. The Supplemental Environmental Impact Report for California Water Fix was issued towards the end of July; the deadline for public comment is September 17. The changes include reducing impacts to wetland areas; addressing the locations of shafts for access or retrieval of tunnel boring machines; changing the locations for where reusuable tunnel material will be temporarily placed, reducing power line needs, reducing some of the impacts to the town of Hood, and some realignment in the south Delta to avoid sensitive wetland areas and to modify the approach in that area. “The result of the supplemental EIR is that the refinements do not increase the impacts overall of the project, but the state is going through that analysis and disclosing both how they would do the refinements and how they would deal with each of the areas,” said Mr. Arakawa. The Delta Reform Act established the Delta Stewardship Council and established the state’s policies of coequal goals for the Delta for water supply reliability and protecting, restoring, and enhancing the ecosystem in the Delta. Under the Delta Reform Act, the Delta Stewardship Council has the responsibility for administering the Delta Plan that was adopted in 2013. As part of the process, the Council receives a certification from project proponents that the action is consistent with the Delta Plan. 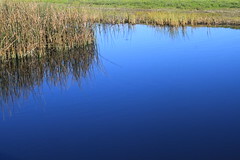 The Department of Water Resources submitted a certification of consistency to the Delta Stewardship Council on July 27th. There is then a 30-day period to allow parties to determine whether they will appeal that certification. The overall goal is to get through the certification process and any appeals that would come forward by the end of the year, he said. Continuing efforts include negotiating a master agreement with the Department of Water Resources for how the 3000 cfs portion of the tunnel would be managed and how that agreement would work between Metropolitan and the Department of Water Resources, Mr. Arakawa said. There is an interest from the Santa Clara Valley Water District, who is both a State Water Project and a Central Valley Project contractor, to secure a portion of the unsubscribed capacity to allow for conveyance of its federal water through the tunnels. As water contractors look to manage their supply and their costs, in recent months, there has been negotiations between the contractors and the Department of Water Resources to look at amendments to the contract to provide for enhanced abilities to transfer water on a multi-year basis and on a single-year basis which build upon the water management tools that are in the existing contract, he said. Director Steiner asked if the Metropolitan is going to finance the unsubscribed portion of the project at all through the JPA. Another director asked about status of negotiations with respect to the master agreement with DWR. Regarding the proceedings at the State Water Board for the change in point of diversion for Cal Water Fix, Director McKenney asks if Mr. Arakawa if he has an any feel for how it’s going at the Board. Jennifer Nevills, Senior Resource Specialist with Metropolitan, next updated the Committee members on the ongoing process at the State Water Board to update the Bay Delta Water Quality Control Plan. The water quality control plan for the Bay Delta is to meet requirements for the federal Clean Water Act as well as the state Porter-Cologne Act. The plan identifies beneficial uses of water such as municipal uses, agricultural uses, fish and wildlife, agriculture, and recreation and then adopts water quality objectives for those beneficial uses and sets standards to meet those objectives. The plan is subject to a periodic review. This update has been in progress since 2009 and the Board is currently working to update the 2006 water quality control plan. The update is unrelated to the hearings underway for the change in point of diversion for California Water Fix. The process to update the water quality control plan is occurring in two phases. 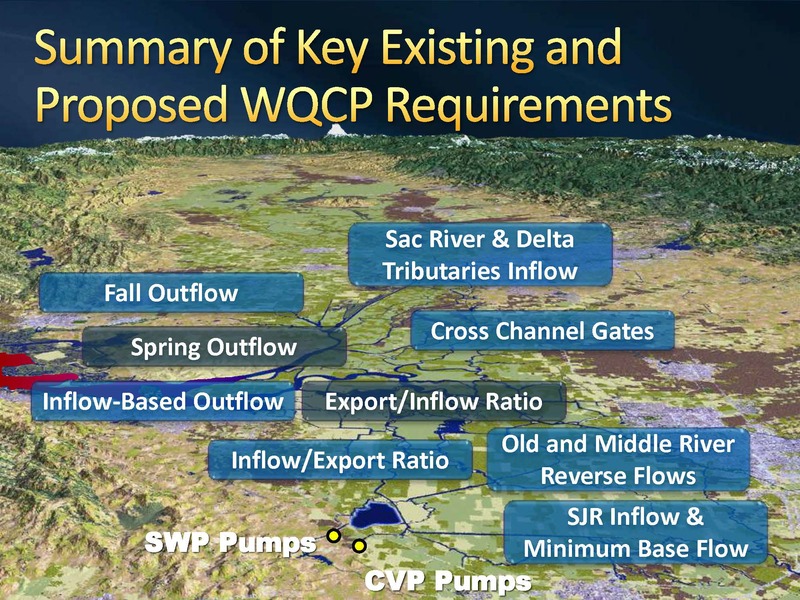 Phase 1 is for the San Joaquin River and Southern Delta water quality objectives; Phase 2 relates to the Sacramento River and tributaries coming directly into the Delta as well as interior Delta flows and cold water. “This is important because it essentially sets water quality standards in the Delta, so they set salinity standards and flow standards, and it can directly affect our export capabilities for the State Water Project and the CVP,” Ms. Nevills said. Throughout the process, Metropolitan has been involved in the process to update water quality control plans and and working with the State Water Contractors to provide input throughout the process. In general, Metropolitan has concerns about the unimpaired flow approach and the science and methods behind using unimpaired flows and correlating that to species abundance. They have also stated their concerns with implementation, telling the Board that they should consider development of comprehensive solutions, which has involved into a voluntary settlement process. She noted that over the course of ten years, they have submitted literally hundreds of pages of comments. Ms. Nevills then expanded on the unimpaired flow approach. 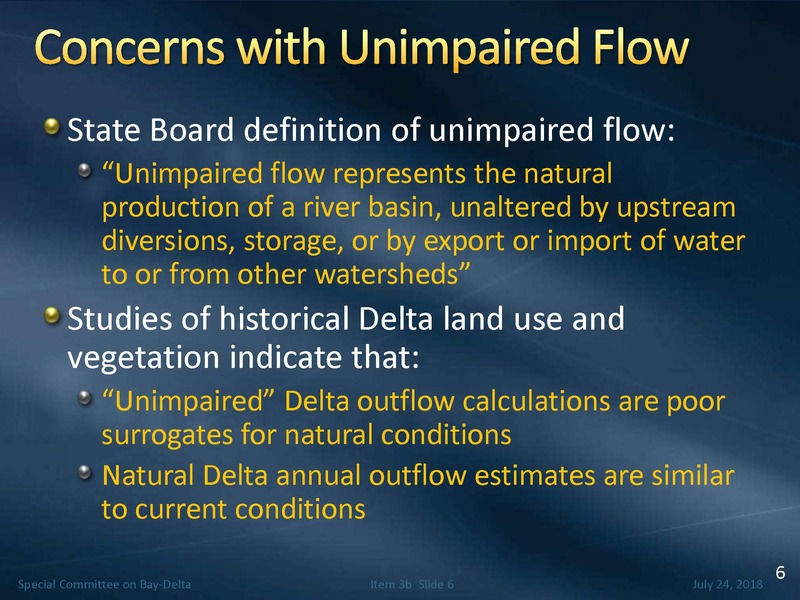 The State Board defines unimpaired flow as the natural production of a river basin as if it was unaltered by diversions, storage, import or export from that basin, so essentially what would have happened had there been no development in that basin, she said, noting that they recommend a percent of that unimpaired flow to be outflow into the Delta and out of the Delta. She explained that in the natural Delta, the flows regularly spread out into the Valley and into the floodplains, infiltrating into groundwater, and they took their time coming back in to the Delta as outflow. She also noted that a lot of outflow was taken up by the vast wetlands and vegetation and essentially was evapotranspirated, or used up. The State Water Board recently released two documents for the update. The first was for Phase 1, which has to do with the San Joaquin and the Southern Delta salinity standards. The Board is near the final stages for Phase 1; they released the draft final CEQA document earlier this month. For phase 1, they are proposing flow requirements for the main tributaries to the San Joaquin River, the Stanislaus, Tuolumne, and Merced, of 40% of the unimpaired flow that would be required as outflow from those tributaries; they provide for an adaptive range of 30 to 50%. 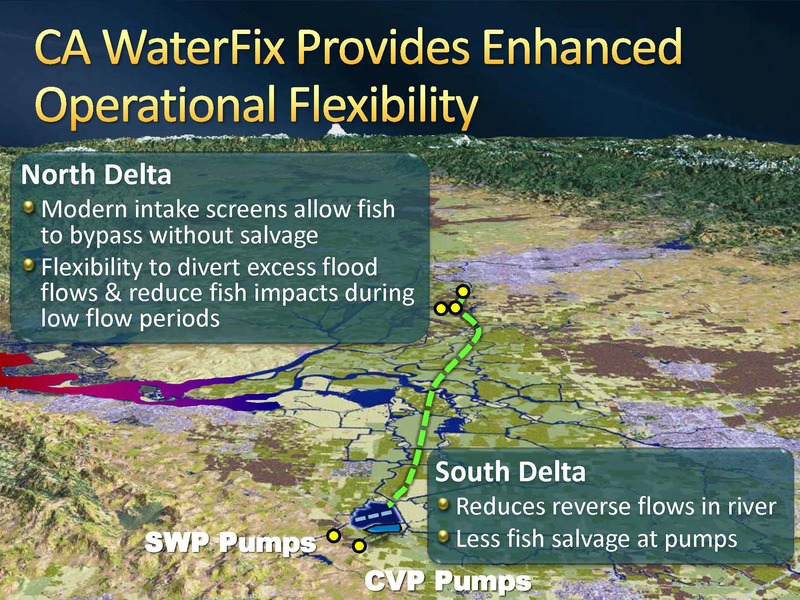 They also add a minimum flow standard in the Delta for February through June at Vernalis, and if those flows were not meeting that minimum flow standard, those tributaries will have to make additional releases to meet that minimum. In addition, it includes some modified salinity standards for the south Delta as well as additional monitoring locations. The implementation for Phase 1 is more defined then for Phase 2. The Board calls for the establishment of a working group for the tributaries that would include water users on those tributaries as well as federal and state fisheries agencies and the State Board itself; those groups would work to provide recommendations for biological goals, adaptive management, and operations. The proposal also calls for developing specific biological goals for salmonids, such as abundance, population, distribution of population, and habitat – things that can be measured and tracked on a timeline, she said. They are looking for very specific things to gauge success in this program, and they would move within that adaptive range of 30 to 50%. In addition, it creates additional monitoring and evaluation and reporting types of requirements. For Phase 2, the Board released a framework document. Phase 2 is not nearly as far along as Phase 1, although additional steps will be taken to get Phase 2 to that point. The framework document proposes tributary flows on the Sacramento and the tributaries that flow directly into the Delta from the east side tributaries of 45 to 65%. 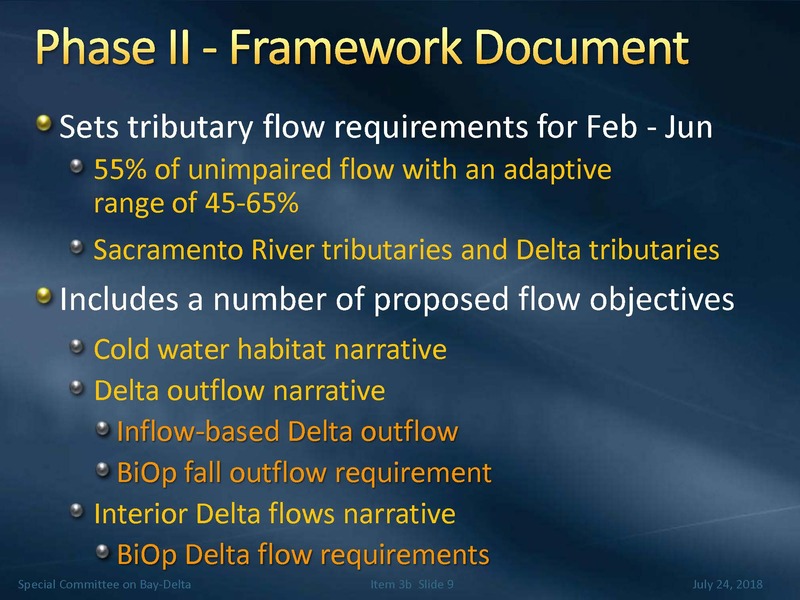 The framework document for Phase 2 also covers the Delta itself. They have a number of flow objectives for the Delta; one is the cold water habitat narrative which are essentially words describing what they want, such as sufficient quantities of habitat at suitable temperatures that are maintained to support passage, holding, spawning, incubation, and rearing of salmon. The plans for implementation are not as far along as the Phase 1; the framework document simply states that these tributary flows would be for each tributary and that monitoring and compliance points for each of those tributaries would be established. Ms. Nevills also noted that there is a process in the works to develop voluntary settlement agreements. In September of 2016, Governor Brown sent a letter to the State Water Board Chair Felicia Marcus, asking that they pursue voluntary agreements and asked that their staff give time and focus to implementing potential voluntary agreements. At that point they hired the former Interior Secretary Bruce Babbitt to facilitate that process between all of the parties. In the past, Ms. Nevills pointed out that there have been some great examples of successful implementation of voluntary agreement, such as the Yuba Accord and the Bay Delta Accord. Comments on the Phase 1 document were due on July 27; Metropolitan is developing their comments with the State Water Contractors and will submit those by the deadline. The public meeting for adoption of Phase 1 is scheduled for August 21st and 22nd. The State Board is planning to receive comments and can potentially adopt the Phase 1 document at the time. “I’m not a water rights expert, but what I’ve seen is that they are equally pursuing water from senior water rights holders all the way down, so there is no distinguishing priority in wanting that unimpaired flow,” she said. “Except that they’ve created a new higher priority than everybody else,” noted Director McKenney. The agenda, meeting materials, and webcast are available by clicking here.